In a study reported in Angewandte Chemie International Edition, the research team headed by Prof. CHEN Xueyuan from Fujian Institute of Research on the Structure of Matter (FJIRSM) of Chinese Academy of Sciences described an innovative approach to tweak the persistent luminescence with the help of all-inorganic CsPbX3 (where X can Cl, Br, or I) perovskite quantum dots (PeQDs) as efficient light conversion materials. In the design developed by the team, CaAl2O4:1%Eu2+, 0.5%Nd3+ (CAO) afterglow phosphor is incorporate into a polydimethylsiloxane (PDMS) substrate and spin-coated onto a quartz plate to act as a light storage layer to tap the ultraviolet light and store the excitation energy, which is then gradually released and results in blue and violet afterglow emission. The photons persistently emitted from CAO are subsequently absorbed by CsPbX3 PeQDs in the light conversion layer, resulting in electron-hole pairs (excitons) in the valence band (VB) and conduction band (CB) of PeQDs, which is then followed by photon emission by means of exciton recombination. The researchers tailored the bandgap of CsPbX3 PeQDs by changing the halide compositions and achieved tunable persistent luminescence covering the entire visible spectral region, together with extremely synchronized afterglow decay acquiring from that of CAO and a color gamut broader than 130% of the NTSC television color standard caused by the narrow bandwidth of PeQDs. 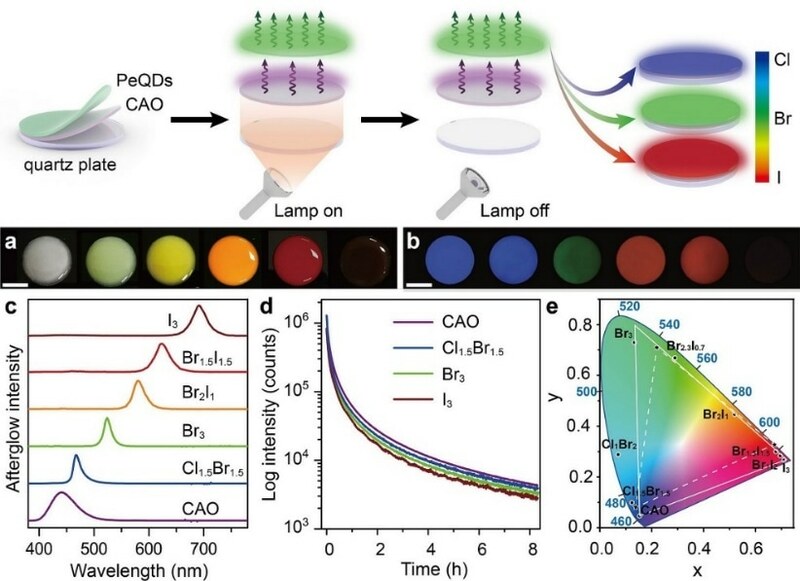 Moreover, they used the efficient afterglow light conversion approach to show that it is possible to develop a white-emitting persistent light source and dark-light multicolor displays. These outcomes offer a general strategy for tweaking the persistent luminescence of afterglow phosphors, thereby paving the way for new opportunities for using persistent luminescence materials such as developing a white-emitting persistent light source for energy-saving thruway lighting, afterglow coding for multilevel anticounterfeiting or complex data storage, and dark-light multicolor displays in billboard.